...The sprawling Mega-Prison in the heart of Gotham City, home to its most violent thugs and infamous super-vilains. With the lives of innocent civilians at stake, only one man can save them and bring justice to the streets: Batman. 04-10-2013 artikskarab Box Text NO ESCAPE FROM ARKHAM CITY ...The sprawling Mega-Prison in the heart of Gotham City, home to its most violent thugs and infamous super-vilains. With the lives of innocent civilians at stake, only one man can save them and bring justice to the streets: Batman. 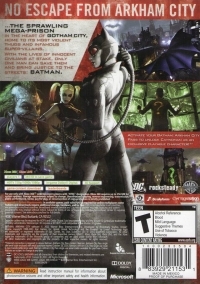 This is a list of VGCollect users who have Batman: Arkham City in their Collection. This is a list of VGCollect users who have Batman: Arkham City in their Sell List. 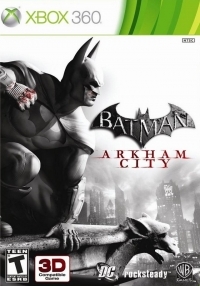 This is a list of VGCollect users who have Batman: Arkham City in their Wish List.